Are you looking for a way to make sure your voice is heard when it comes to important issues being discussed at the Colorado State Capitol, but you don’t live in Denver? Well if so, you’re in luck -- we’re coming to YOU! 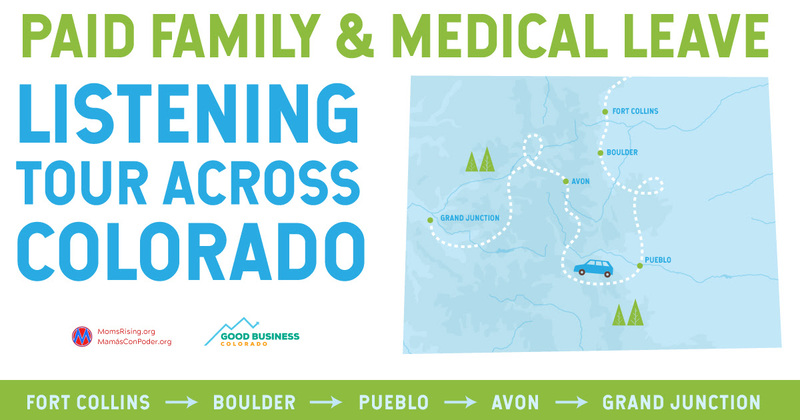 MomsRising and Good Business Colorado would like to invite you to be an important part of a very special conversation between community members like you, local business owners, elected leaders, and families to talk about paid family and medical leave, and YOUR VOICE is critical to the conversation! → RSVP today to hold your spot at a paid family and medical leave listening tour event near you! That’s right, our community is coming together to talk about one of the most important issues facing working families right now: paid family and medical leave. And we need YOUR input. We want to hear what you think about access to paid family and medical leave. If you’ve had it - did it help? Do you NOT have paid leave and have suffered because of it? What is essential to include in a Colorado paid leave program? We'll be talking about all of this and more! In a year when it's so easy to feel defeated by the tone of national politics, this is a powerful opportunity to have real dialogue, pro and con, about a critically important issue in a way that moves us all forward together. Make your voice heard! Enjoy free snacks and beverages while we all share some big thinking and strategizing about ways to lift up our families, businesses, and economy! *** Want to be there? Make sure to RSVP now -- space is limited! Who: MomsRising, Good Business Colorado, moms, business owners, lawmakers, families, and YOU! All are welcome! Why: This is your opportunity to share what is most important to you in creating a paid family and medical leave program that works for everyone across the state! → RSVP today to hold your spot! Hope to see you there! Together, we’re a powerful force for women and families in CO!